The second collaboration between MB&F and Stepan Sarpaneva has been a long time coming for fans of both, but the Moonmachine 2 finally made its debut this year, and we had the opportunity to spend a little time with it earlier this year. It is quite a different horological beast to the original Moonmachine. This time it finds itself housed in the HM8 body, in a case that is 0.5mm thicker than that of the HM8 because of the additional new moonphase display. Its full measurements are 49mm x 51.5mm x 19.5mm. This is a moon machine and not a sea one, so water resistance is 30m/ 3ATM. Sarpaneva’s moon (my favourite horologically-related moon) appears in several places in this new piece. 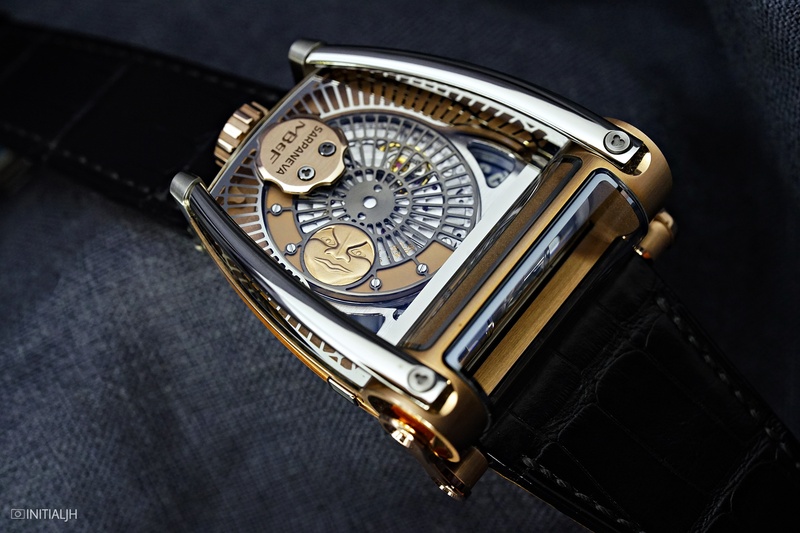 The most prominent of these is what was previously a battle-axe rotor, now in an open-worked form featuring Sarpaneva’s moon, a form that is familiar to those familiar with his watches. The rotor is attached to a movement developed by MB&F from a Girard-Perregaux base calibre. His other style of moon for which he is known lies with the hours and minutes, all of which are projected via an optical prism that refracts the flat hours, minutes, and moon (actually two moons mounted on a disc) to appear as if they are perpendicular to the engine. The prism is cut to magnify the hours and minutes by 20 per cent for readability reasons, but the moon phase is not similarly magnified, for distortion reasons. The dual moons rotate under Sarpaneva’s Korona ring, and are corrected by a pusher. Each moon is made of gold and hand finished. The two moons on the disc have a diametre of 4.5mm and are 0.35mm thick, while the rotor moon is 8.5mm wide and 0.45mm thick. If you are familiar with the HM8 then you will have a good idea of how it sits and feels on the wrist. For those who are unfamiliar with its relative, as you can see in this photo, it sits high, but it also sits okay lengthwise even on a wrist that is slightly on the small side. 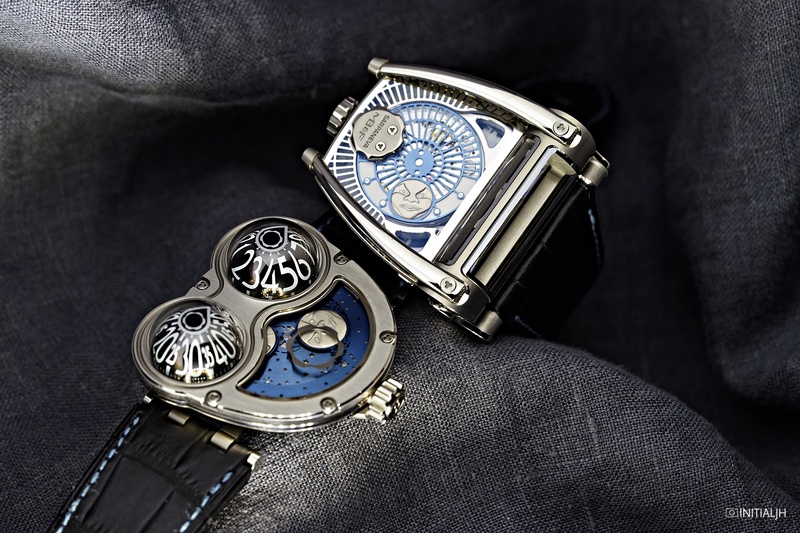 The MoonMachine 2 is available in three limited editions of twelve pieces each; one in titanium with white gold moons and a light blue sky and rotor, one in blackened titanium with white gold moons, a dark blue sky and rotor, and one in red gold and titanium with red gold moons and an anthracite sky and rotor. The RRPs are 88,000 CHF (plus VAT) for the titanium models and 95,000 (plus VAT) for the rose gold model.